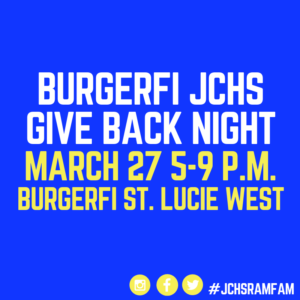 BurgerFi in St. Lucie West is hosting a John Carroll Give Back Night on Wednesday, March 27 at 5-9 p.m, with 15 percent of sales benefiting JCHS. Please show the attached flyer to the cashier before placing your order. There will be a burger eating contest with prizes. We need three participants. Please let me know if you are interested.